This is the at-home hand moisturizer that uses the same technology utilized by professional aestheticians to rejuvenate dry, chapped skin. Using distilled or fresh tap water, the moisturizer’s ultrasonic transducer emits an oxygenated warm or cool hydrating mist seven times smaller than water droplets that penetrates deep into moisture-starved skin, helping keep hands smooth and supple. 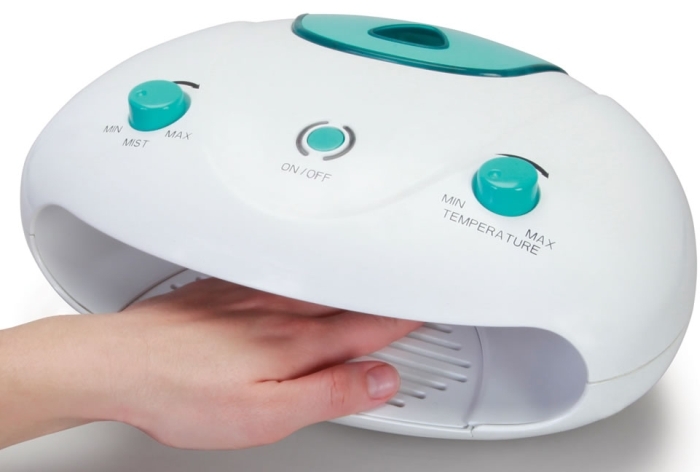 Simply insert hands into the front of the unit; the moisturizer treats both hands simultaneously and has control knobs that precisely adjust mist output and temperature from about 62Â° F to 92 FÂ°.